The Hal Saflieni Hypogeum feels like a bit of an exclusive place to visit. Only ten people an hour are admitted, you need to book in advance and tickets are pricy at €30 (£24) each. Frankly, we wondered whether it would be worth it, but we needn’t have worried as it was fascinating. 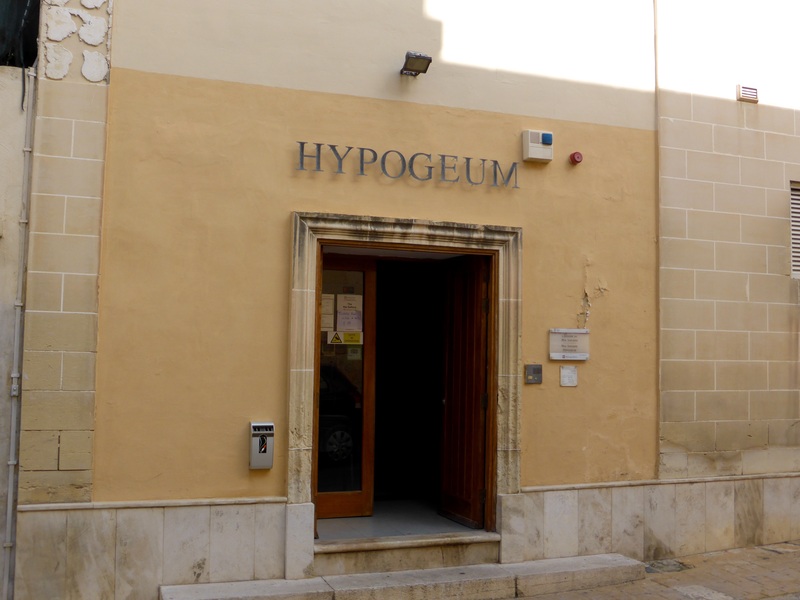 So, first things first, what is a hypogeum? Pretty simple really, it’s a fancy word for an underground burial chamber. 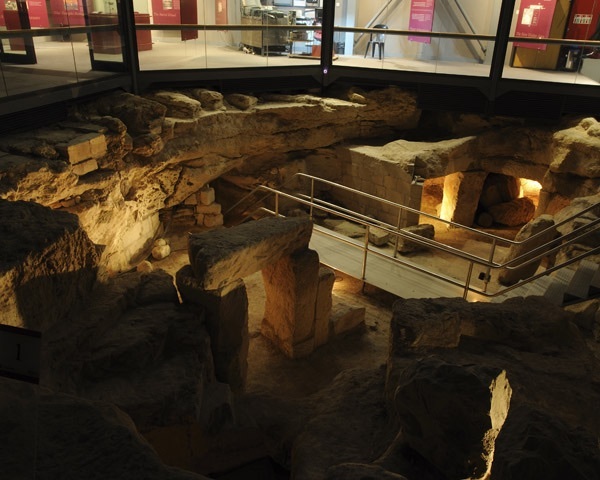 In this case the structure is hewn from the solid limestone rock which makes up much of Malta’s geology. As the group gathered at the entrance, our bags and cameras were put into a locker and each person was given an audio guide. First we were ushered into a small exhibition room and then shown a short film about the history of the hypogeum. It was built between 3600BC and 2400BC and consists of three levels. The level closest to the surface is the oldest and sustained some damage when the hypogeum was rediscovered in 1902 by a stonemason laying foundations for new houses. As we descended through the top level, the audio guide explained that the builders who rediscovered the structure didn’t report it right away which meant that quite a bit of damage occurred here and anything that might have survived of surface features was completely lost. Unfortunately the first man to oversee the excavations then died unexpectedly while out of the country and his four years of dig notes have never been found. It was interesting to see how the chambers had been carved out from the stone often using natural fault lines to dictate where walls would be. 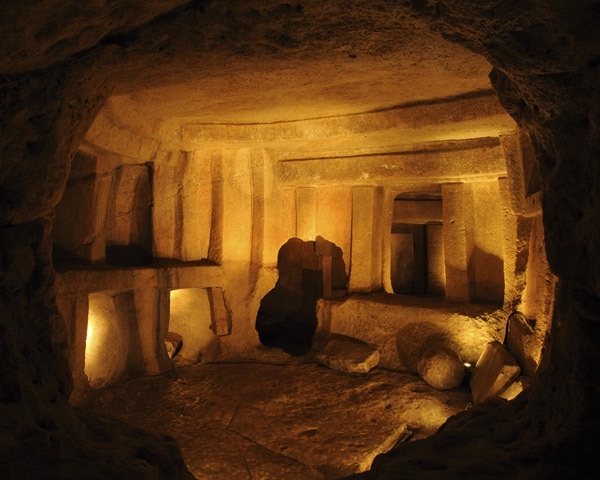 The finish in some of the chambers imitates the look of above ground temples built in Malta at the same time, like the ones we visited at Hagar Qim and Mnajdra. At the farthest extent of the tour walkway was the chamber which archaeologists have called the Holy of Holies where this is most apparent. Indeed the corbelled design of the carved roof can clearly be seen here and added weight to theory that the above ground temples had roofs constructed using this method. Also in the middle level, in the Oracle Chamber, some of the roof paintings have survived. 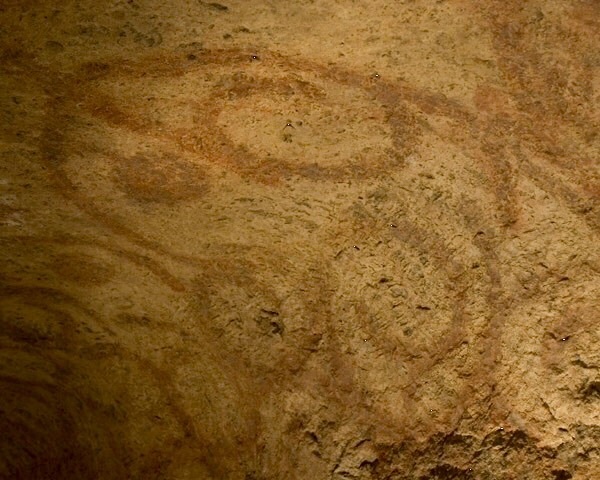 Unfortunately the symbolism of the swirling pattern hasn’t come down to us, but archaeologists speculate that the red ochre colour used was because of its similarity to blood and may represent life. In the same room, the audioguide brought our attention to doorways raised above the level of the floor and explained that when the Hypogeum was in use this was likely because the floor would have been several centimetres deep in a mix of soil and skeletal remains – a slightly gruesome thought. As well as the structure itself, archaeologists unearthed human bone fragments as well as a number of other artefacts, including personal ornaments and various types of figurines. It is thought that around 7000 people were buried there over the course of 1000 years which didn’t sound like many to me (only seven per year) but no other explanation was given so perhaps it isn’t so remarkable. 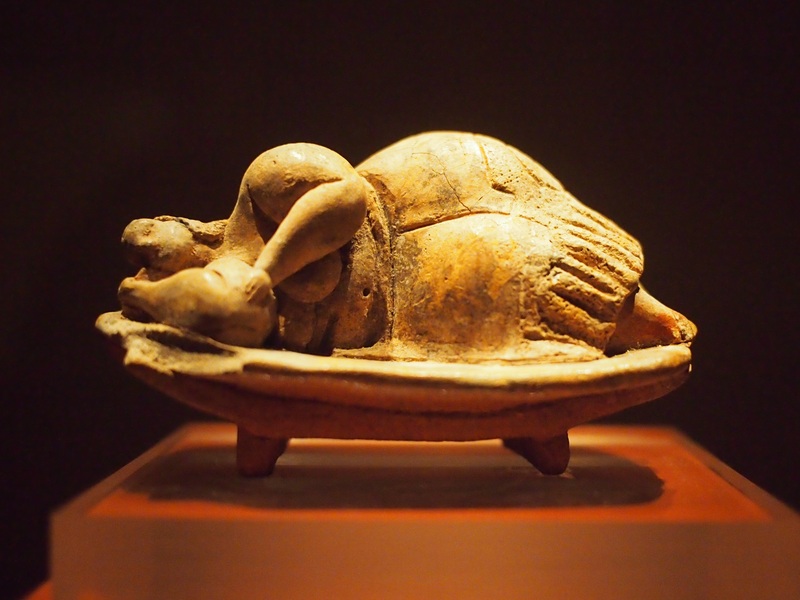 The most famous of the statues found here is the ‘Sleeping Lady’ which we later saw in the Museum of Archaeology in Valletta. Afterwards it was very clear to us why there are all the restrictions on entry – only ten people per tour, no bags or photos inside, etc. Quite apart from the conservation concerns (erosion from increased carbon dioxide levels from more people, photography flashes damaging wall paintings), the place is pretty small and even with a group of ten there was a certain amount of shuffling around at each stage so that everyone got a look at the interesting elements in each chamber, and photography would have slowed the tour down even more. 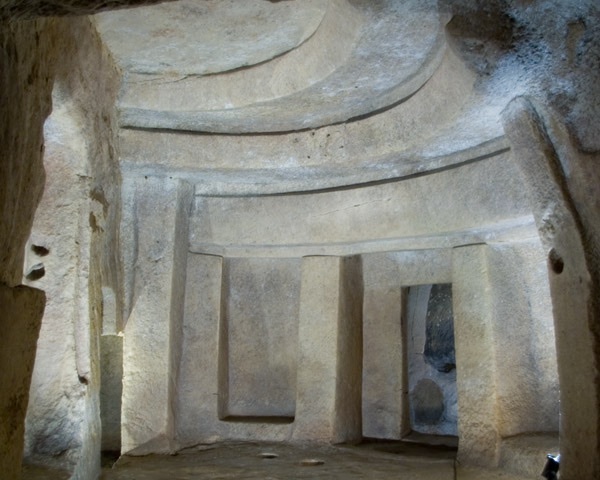 It is humbling to think about the people who constructed the Hypogeum 5000 years ago. They wouldn’t have had metal tools, just flints and bone and would have been shrouded in darkness – obviously no electric lights in those days and no soot marks have been found so no fixed torches either. The audio guide really added to the experience too, it was well put together with atmospheric background music composed for it by Renzo Spiteri and actually recorded inside the Hypogeum. The vision and dedication which must have been passed down from generation to generation in its building is mind blowing. This entry was posted in Places and tagged Hypogeum, Malta on December 3, 2014 by Julie. :) Our tastes are similar so if you like somewhere there’s a pretty high chance that we will too! What is 29 + 18 ?